Shift to the Future: Self-sufficient or Inter-dependent? I’ve been thinking a lot about our complex world lately and how our education system does or doesn’t match what we need. There’s a lot of buzz about the need to support 21st century or personalized learning. Although there isn’t necessary consensus on what that means or entails, my impression is that most people recognize that our world is quite different today and is rapidly changing and our education system should adapt accordingly. Education hasn’t necessarily evolved and transformed fast enough to fully match our world’s needs. I’ve written before about complexity (Education for an automated future or Complexity is Everywhere) and I am in awe of our potential. I’m reading a couple of excellent books right now that are quite fascinating. One is Macrowikinomics by Don Tapscott and the other The Rational Optimist by Matt Ridley (thank-you @lisarink e for loaning this one to me). I’m 39% through Macrowikinomics on my iPad and at p. 41 of Rational Optimist (traditional book). Sidebar: the more I read non-fiction on my iPad, the more I really appreciate it, the ability to highlight and take notes which sync up to my kindle account on Amazon is huge. Think for moment about what I just wrote about the iPad. Can any one person explain in complete detail how that works? How about one piece, say how the iPad works to support touch to enable highlighting, note taking, and how the Kindle app works at a programmatic level to support that and send it to Amazon for my use later. There are literally millions of details and millions of people ultimately involved in creating the iPad and the Amazon Kindle service. No one person can explain or do all that is required to make this possible. People are incredibly inter-dependent today! 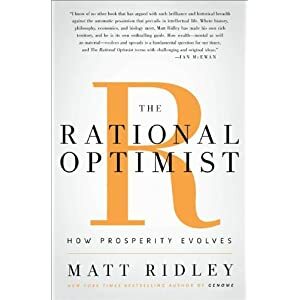 Matt Ridley provides some very thought provoking examples in his book comparing “the simple life” that some people today may long for where people were very self-sufficient. But, he builds a solid case for how inter-dependence creates prosperity and growth while self-sufficiency creates persistent poverty. This story from Matt’s book serves to illustrate the difficulty of being self-sufficient. My iPad and Amazon Kindle example, if broken down into the raw material and inputs necessary to produce them, would be overwhelmingly detailed and complex. Impossible for a world filled with self-sufficient (autonomous) people to ever produce! When you look back in history and trace out how people lived, there is very little complexity for 1000’s of years. People, other than kings or rulers, lived very self-sufficient simple and very difficult and poor lives. Most of their time and other resources (which were few) went into acquiring or maintaining simple food, shelter, clothing and not much else. But examine the past 500 years, the past century, past 50 years, past 20 years, etc. and a trend is clear from self-sufficiency to inter-dependence which has raised the standard of living for more people in our world then anything ever before. Yes, we still have very poor people and we need to figure out how to raise their quality of life but this will only be possible through inter-dependence. Think about Gutenberg’s first printing press in 1440. Before the press, monks and others labored their entire lives copying texts and only a few privileged persons were allowed to benefit from this work. Post-Gutenberg saw knowledge spread and explode, slowly at first, but instantaneously today through blogs, tweets, wikis, and other means. Chris Anderson of TED fame talks here about accelerated innovation through video and claims this could be as significant as the invention of print. Perhaps Chris will be right. In my own experience, I have found video to be a powerful tool for story telling. I often use it to record what I observe in classrooms and then share these stories through presentations or my blog. Video does have a way of connecting people to events and also bringing the event to others in ways not possible with mere text. Think about self-sufficiency and inter-dependence in an teaching context. Should teachers work autonomously and in isolation from each other? Or, should they be learning, sharing, and working together through rich experiences within professional learning communities. Should teachers be creating and sharing their lesson materials, assessments, their ideas, openly and freely for the benefit of others outside their classrooms? What do you think this would do to the growth of learning? What about students? Should they be learning and working on assignments independently or required to collaborate and share to achieve results? Should individual student success be dependent on their inter-dependent work? Should the definition of cheating be reexamined in the context of required sharing and collaborating? Add technology to the learning environment and we can create the potential to accelerate learning. History suggests that interdependent learning and work leads to far greater progress and achievement than the alternative. Think again about the toaster example. People all around the world are working for you, when you buy a toaster. You can not achieve this on your own. Walk into a grocery store and think about all the food products and conveniences you can purchase (for very little money) – you do not have the ability to produce these on your own. “Culture is sticky. Old habit and old ways of working die hard.”, Macrowikinomics (loc. 515). I believe that our education system has serve us extremely well. We have passionate and capable teachers helping kids learn every day. They are doing an amazing job otherwise how would we have created the complex world we have today? Education is one of the last public institutions that hasn’t yet been substantially disrupted by technology and rapid change. I believe it is an inevitable outcome of accelerated change driven by technology. But now is the time for those involved in the education system to be involved in its disruption, to ensure it adapts to our times and is adaptable as required by a society and world that is rapidly changing and being disrupted, in this century. In this way, we may yet reach our full potential.